We all look back with some regret to favourite eating houses long gone. Melbournians have fond memories of Fanny’s and the Hot Pot Shop and Sydneysiders are still mourning the passing of the Bayswater Brasserie. But this hankering for times past is not a new thing. Back in the mid-20th century Sydney’s bon vivants pined for the vanished restaurants of the pre-World War I era. Perhaps, most of all, they yearned for the heady days before the temperance movement succeeded in making it impossible to accompany your dining with a decent glass of wine at almost any hour of the day or night. Writing in the Daily Telegraph in 1948, journalist Josephine O’Neill lamented the passing of the days when ‘Sydney used to be so gay it was known as the “Paris of the Pacific”. “With the police now blitzing late hour cafes, threatening to raid night clubs, and wowsers seeking to clamp down gloom everywhere, the spacious days of Sydney’s bright life seem far away,” she wrote. Among the restaurants remembered fondly were the Trocodero Café Restaurant, Holland House (beloved of the theatre set) and even Podesta’s, famous for supplying penny pies to the newsboys and street urchins. Supreme among the turn-of-the-century dining establishments, though, was The Paris House. Both writers are unstinting in their praise of this establishment. 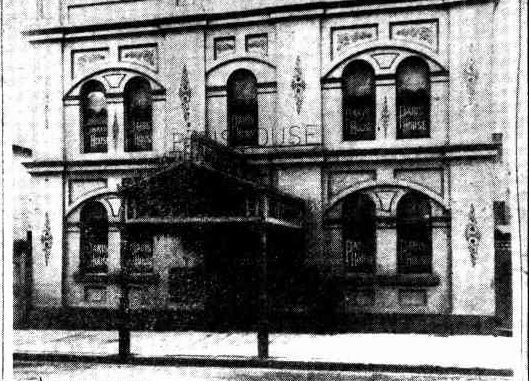 Opened in 1890 in Philip Street, The Paris House was originally run by a Mr O. Desneaux. It was beloved of the intelligentsia and high society and hosted receptions and dinners in honour of visiting artists and performers. Later run by Gaston Lievain, from Lille, it was Sydney’s most glamorous restaurant. There was a ground-floor bistro, private dining rooms where lovers could meet, and a top floor sponsored by the Moet champagne house. ‘Paris House, in one of its two main dining rooms, served seven-course dinners with fine wines….The waiters were Continental and the dinner was served in the proper way – white wine with the fish, red wine with the roast, and champagne. “Paris House had deft and discreet waiters, red plush settees and white tablecloths – and remained open until 1 or 2 a.m.
Brodsky had his own memories of the establishment. Describing his preference for the “pre-steak and egg era” he observed that “Paris House was really for the gastronomes who could pay for their pleasures and not mind digging their graves with the knife and fork. The daily bill of fare, Brodsky says, was “a little less comprehensive, but equally delightful to the palate”. It attracted such luminaries as Lionel and Normal Lindsay, W. C. Penfold, and Frederick Wymark of the Angus & Robertson publishing house. One of the long-serving waiters at The Paris House, Otto Mayer, became well-known in his own right, to the point where his departure in 1913 to take charge of service at the new Holland House restaurant in Castlereagh Street prompted a newspaper article of its own. It was regarded as the height of adventure when a girl was enticed to dine alone with a man in one of the rooms on the ground floor. A saying of the time “As dumb (or was it blind?) 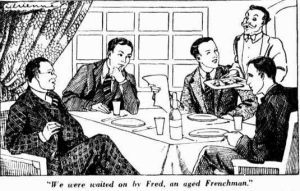 as a Paris House waiter” referred, not to the wait staff’s intelligence but to their discretion. Alas, the fortunes of The Paris House waned over the years. Lievain sold the business in 1911 and upon his departure the new owners employed one Phillip Pic as chef-in-chief. It did not go well. Waiters complained about the standard of service they received from the kitchen, food was often served cold and the proprietors accused Pic of defrauding the business by inflating the price of the goods he purchased on their behalf. Pic was dismissed and the matter ended up in court, where our friend Otto, called to give evidence, deplored the falling food standards and revealed the practice of waiters giving money to the cooks to receive decent attention. Perhaps that’s why he left. Worse was to come. On 17 June 1916, the people of New South Wales voted overwhelmingly to close the pubs at 6pm. 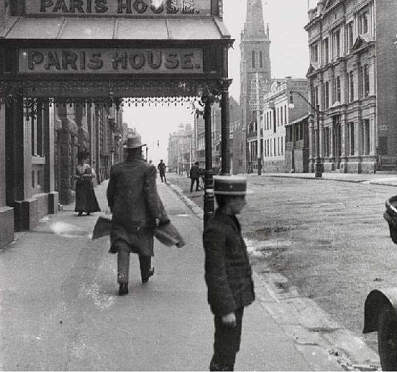 It marked the end of the “belle epoque” and a new, dour mood in Sydney. While the Temperance Alliance was unsuccessful in its attempts to achieve American-style prohibition, licensing laws became increasingly restrictive, restricting the sale of alcohol almost exclusively to pubs for decades. Tossing back champagne until the early hours became a thing of the past. Thirty years and two World Wars later, amendments to the Liquor Licensing Act allowed restaurants to serve ‘light wine and malted liquors’ with meals, but only until 8.30pm. Restaurants with seats in alcoves along the wall were excluded. The police presented evidence that, with the combination of cosy alcoves and liquor licences, ‘the way would be open for a great increase in promiscuous sexual behaviour’. The Paris House, with its many private rooms and ‘dumb’ waiters, would surely not have qualified.